BART police appeared in greater numbers at two stations and between the Coliseum and West Oakland stations Thursday as part of the new chief's strategy to cut fare evasion, police and a BART spokeswoman said Friday. Between 10 a.m. and 2 p.m. two sergeants and eight officers conducted an operation between the Coliseum and West Oakland stations where they spoke with 27 people, issued 18 citations - most of which were for fare evasion - and arrested one person. Between 8 a.m. and 4 p.m. at the Daly City station one sergeant and four officers spoke with 16 people, cited eight for fare evasion and arrested one on an outstanding warrant. Between 7:40 a.m. and 10:20 a.m. at the Richmond station, a sergeant and two officers spoke with 14 people and issued nine citations for fare evasion or possibly other offenses. "We are cracking down on fare evasion and everyone needs to pay their fair share," BART spokeswoman Alicia Trost said. BART has been doing this for the past month or two, Trost said. 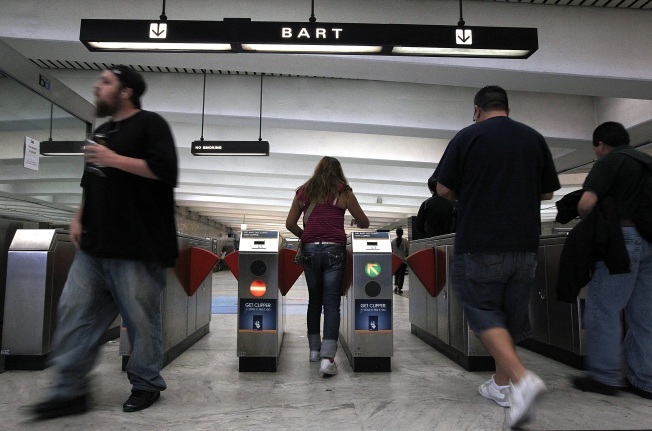 Fare evasion costs BART an estimated $15 to $25 million annually. The increased enforcement is being done throughout the system, not at any specific stations. BART officials are also making it harder to avoid paying a fare by installing such things as higher barriers around the paid areas, according to Trost. Also, BART's board is considering hiring community service officers to check whether riders in the paid area of the system have paid. The issue will be heard by the board on Oct. 26. Trost said the added police presence also deters crime.